On January 31, 2019 – join Bridges Health along with renowned speakers from across Canada, including Dr. Georges Sabongui, Allan Kehler, Converging Pathways, and Lesley & Matt Kelly to be a part of this important conversation. Set in the unique format of an educational afternoon conference and evening gala, it is a do not miss event. A day of understanding the challenges to mental wellness in agriculture sectors, Indigenous communities, and the resource industry. 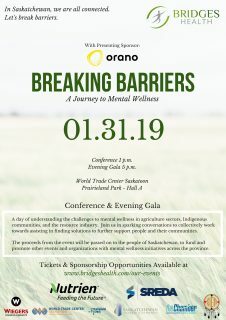 ← The CMHA 2019 Cash Calendar – Help Support Mental Health Education in Saskatchewan! Have you ever thought about writing an ebook or guest authoring on other sites? I have a blog centered on the same ideas you discuss and would love to have you share some stories/information. I know my visitors would enjoy your work. If you are even remotely interested, feel free to send me an e mail. 318xQJ Muchos Gracias for your article post.Really thank you! Want more.